Gymnastics Birthday Party Invitation | Not At My House! 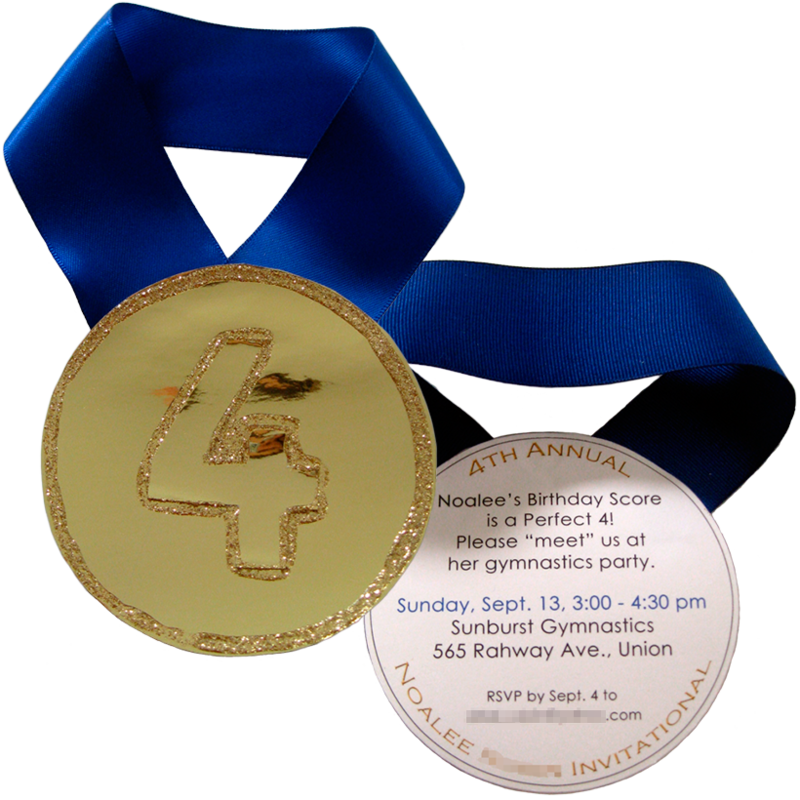 Not everyone can do a cartwheel (or even touch her toes on a reliable basis), but everyone can make this gold medal invitation. For this invitation, metallic gold paper (bought mine at Michaels) and wide, royal blue ribbon are key. If you look carefully at the photo, you can see that I bought both grograin (right img) and satin (left) — both work equally well. Both were about 1 1/2″ wide. Pick up some gold glitter glue for extra pizzazz, and use cardstock printer paper for the invitation details because standard multipurpose paper is too thin to conceal the ribbon glued beneath it. Start with your word processing or design software (I used Photoshop) and create a circle or a couple of nested circles, roughly 3″ diameter. If I were to do this again, I’d make the outer circle’s border wider to allow for a little latitude when cutting out later. Type in your text and print on cardstock. Cut out the circle and trace on the back of metallic gold paper. Cut out your gold paper along the traced line. Outline the edge of the circle and your child’s age with the glitter glue. After the glitter glue dries, glue both circles together, sandwiching the ribbon in the middle. I made a small loop, which is clearly too short to wear, but long enough to use as a door hanger. If you have tons of ribbon, might want to opt for a wearable length, although it could be harder to fit in a standard envelope and more expensive to mail. This entry was posted in Invitations and tagged blue ribbon, gold medal, gymnastics party, invitation, sunburst gymnastics by jessicazr. Bookmark the permalink. Hi! I was looking for ideas and found your blog/website. Excellent! 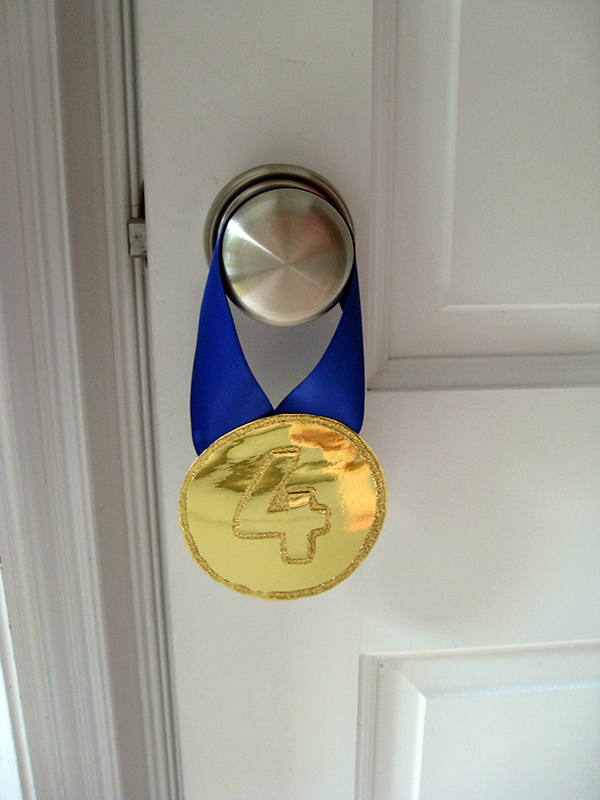 I could do this for my 5 year old’s who will be having his party @ a gymnastic centre next month. Thank you for sharing. Thanks for taking the time to write, Jackie. I’m so glad you found this helpful! Would love to see what you create – please keep me posted. And very happy birthday to your son.